Give a plain sandwich a whimsical – and healthy – twist with a creatively placed banana. 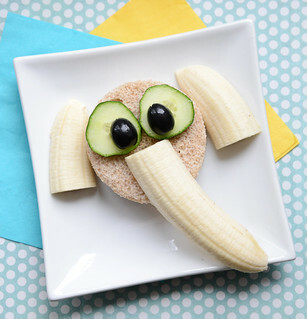 This silly little elephant sandwich was super easy to make and the kids just loved it. I only used a handful of ingredients that I already had on-hand and turned their plain and boring sandwich into something exciting! It really is that easy! And it’s nutritious and delicious too. This is how I made it…. 1. Grab your 2 slices of bread and make your sandwich with the filling of your choice – I used turkey. Grab your circle cookie cutter – or use the open end of a drinking glass – and cut your sandwich into a circle shape. Place your sandwich on a plate. 2. Peel your banana. Make one horizontal cut on your banana about 3 inches from one end. Then slice this piece in half lengthwise. Place each half on either side of your sandwich for the elephant’s ears. 3. Take the remaining piece of banana and slice it lengthwise. Take 1 half and place it on your sandwich for the elephant’s trunk. 4. Grab your 2 cucumber slices and place them on the sandwich for the elephant’s eyes. 5. Finally, slice your black olive in half and place each half on the cucumber eyes. So simple and so silly! This sandwich is packed full of kid-friendly, kid-approved foods and your little ones are sure to enjoy it.